Mosaic art is created by people around the world in the form of murals, tabletops, home accents, pottery, and more. Animals, flowers, patterns, and landscapes have all become popular mosaic subjects. Once you grasp the basics of the craft, it will be easy to get started with these free mosaic patterns. Select the pattern of your choice from those below and and click to download the printable with Adobe Reader. 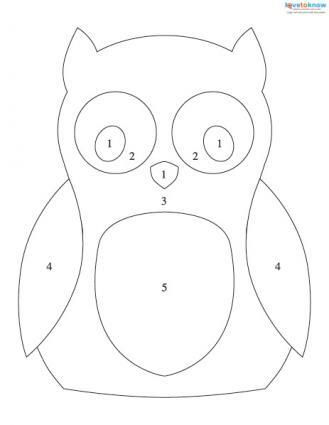 Download this free owl mosaic pattern. This owl pattern would look great in a window pane or on the front of a glass craft block filled with a string of holiday lights. During the night, as light streams through your glass, the owl will cast an array of light around the room. For tesserae, translucent colored glass is recommended. 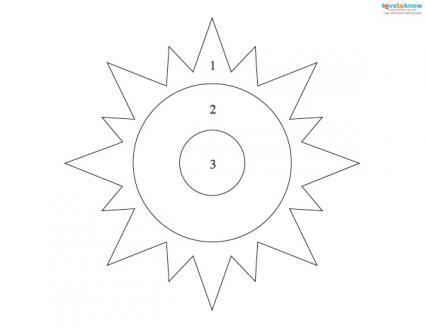 For color 1, consider using black; for color 2, white or yellow; and color 3, grey or brown. You may also choose several shades for the main body (color 3) to highlight around the head and to place shading around the lower body. Dark brown or tan would work perfectly for colors 4 and 5. Download the geometric mosaic pattern. This basic geometric pattern will add a unique splash to a kitchen or bathroom backdrop, or it can be enlarged and used to cover a tabletop. It's flexible, as it can be used with any color combination to match your home décor. Try out a rainbow to add a splash to a kid's room, or stick to subtle beiges and tans for a natural, unobtrusive accent. You can keep to the pattern's original suggestion of just three colors, or go up to five or more. In addition to cut glass, you may want to lay in some small colored tiles, stones, or glass pebbles, depending upon the size of your piece. You may also want to alternate glass fragments and pre-cut tiles for the different geometric shapes within the pattern. Experiment to suit your style. 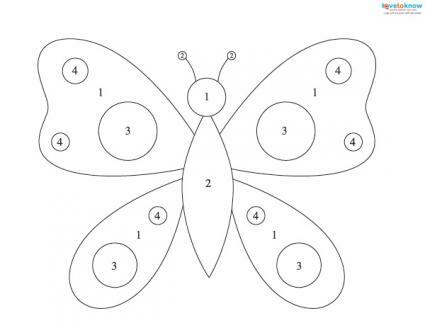 Download this cute butterfly pattern. Choose brightly colored pink, purple, and blue glass to create a cute wall decoration for a young girl's room, or use spring pastels for a perfect Mother's Day treasure. This pattern would also do well adorning a window pane, or consider removing the backing from a picture frame and mosaicing over the glass for a beautiful piece of framed art. Cover a flat stone or brick with this butterfly for a beautiful garden accessory that will shimmer under the sunlight. Replace cut glass with translucent glass pebbles in blue or green for the circles in the butterfly's wings for a unique touch. 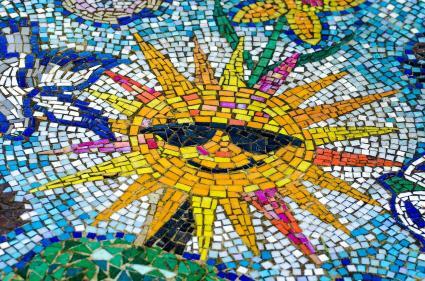 Click for this free sun mosaic pattern. This mosaic sun pattern may be simple, but it's sure to brighten any room. Choose three shades of yellow translucent glass, working your way from darkest to lightest as you move out toward the rays. You can mosaic a sheet of clear glass, which you can hang in a window and let the light shine in, or turn into the focal point of a wind chime to hang on your back porch. This is another pattern that would do well as a garden accent, maybe mosaiced into the bowl of a birdbath or on the bricks of a walkway. Add sunglasses and a smile to the pattern before you start to get the look of the happy sun in the photo at the top of the page. For anywhere that needs a little more cheer, especially to beat those rainy day blues, this pattern will be perfect. For your mosaic, you will need a base, such as a canvas, piece of wood, or even a window pane. Then choose your tesserae, the material you will use to create your design. For these patterns, it is recommended that you use colored sheets of glass and cut them into small pieces that you can arrange into the design. As you'll see in each pattern, the numbers represent different colors of glass to use. You are free to use colors of your choice. You may also choose to use two or three shades of each color so that you can put in highlights and shading. These patterns can be easily resized to fit your surface by copying the pattern into a word processor and changing the size or scaling it using your printer or a copier. If your base is transparent, such as a sheet of glass, you can easily secure the pattern behind the base, work over top of it, and remove it when done. However, if using a canvas or piece of wood, you'll need to transfer the pattern. If you don't want to draw it free-hand, you can use special transfer paper, which you place between your pattern and base, and then trace the pattern. Then you're ready to begin cutting glass and gluing it into place. 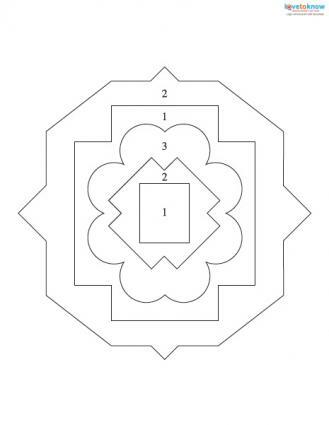 Once you've finished creating these patterns, there are many more you can download from the web. Try a few of these options. This collection of patterns from Delphi Glass can be used for either mosaic art or stained glass. They are all free to download and vary in difficulty. These free patterns from Making Mosaics represent the earth, wind, water, and fire elements of nature. The site offers several techniques to turn the patterns into mosaic art. Mosaic Patterns Online offers a variety of mosaic designs. Most cost around $5, but the site does have a free pattern each month. Fantasy in Glass offers dozens of free stained glass and mosaic patterns, many of which feature popular cartoon characters. Finding the perfect pattern will help you bring your artistic dreams to life. Try thinking outside the box with your search. Many stained glass patterns can double as mosaic patterns, and you'd be surprised how well the drawings inside children's coloring books work for mosaics, too. Whether you're working off of the patterns provided here or a more complex design from the web, you will find that your completed mosaic adds beauty and flair to any ordinary surface, from walls to countertops, gardens, and more.